With alluring layers of starchy goodness, these Crispy Hasselback Potatoes with Rosemary and Garlic are a perfect side dish for any dinner! Today I’ve got a wonderful side dish for you that pairs perfectly with just about any protein… Steaks, chicken, roasted lamb, baked ham, pork chops. Our Crispy Hasselback Potatoes with Rosemary are a crowd pleaser no matter what you serve with them. 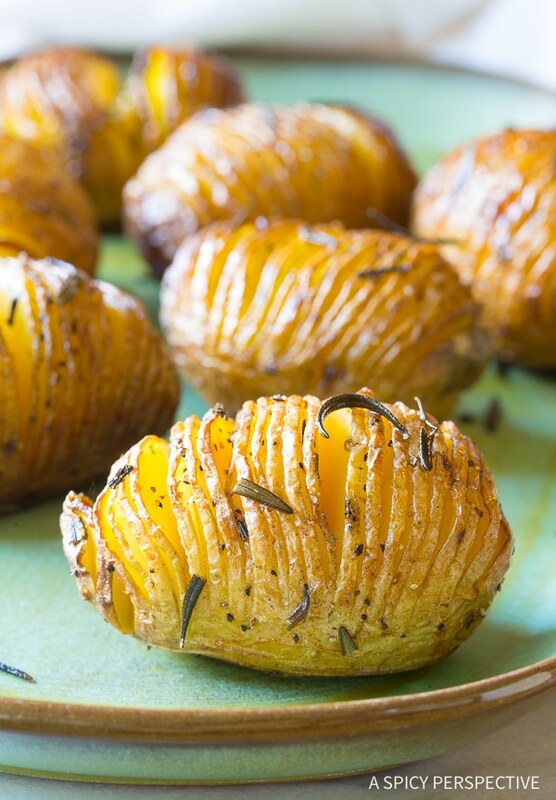 Hasselback Potatoes are a style of baked potato that was first created in a tavern in Sweden called Hasselbacken. 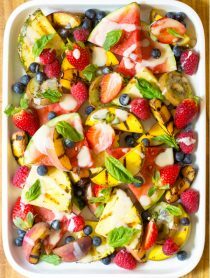 They are a beloved part of Swedish cuisine that have been replicated all over the world into many variations, with uncountable toppings. Hasselback potatoes are popular because of their visual appeal. 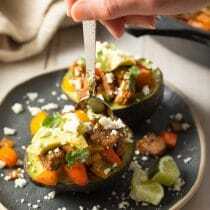 Yet, hasselbacks also have a lot to offer in taste and texture. 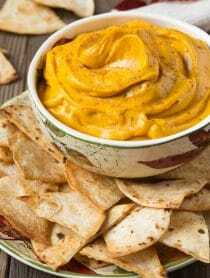 The thin rims of skin around each slice turn ultra cripsy and chip-like while baking. 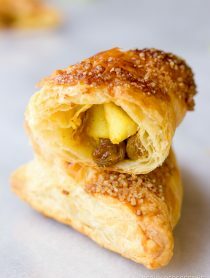 However, the interior layers become soft and sumptuous, seasoned with garlic butter, herbs, and spices that pool down between the folds. Hasselbacks are baked potatoes at their finest! 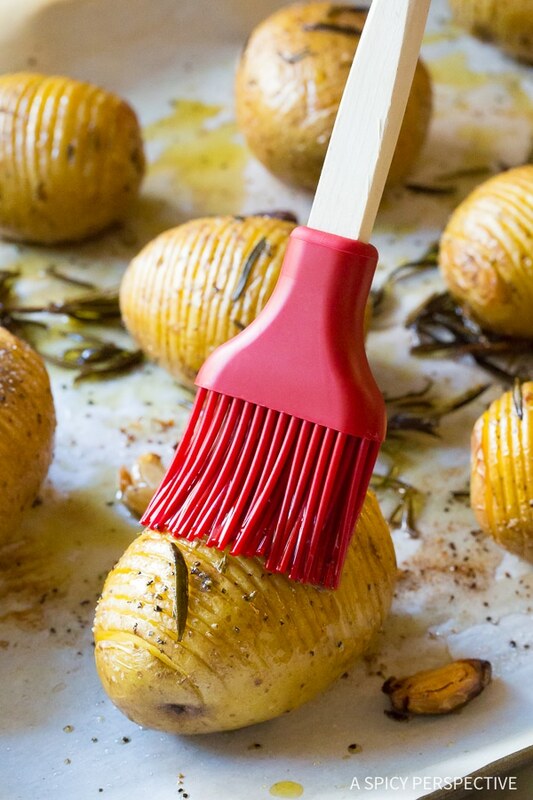 How Do You Cut Hasselback Potatoes? I’m here to tell you, yes you can! Hasselback potatoes are extremely easy to make. Simply hold a potato at one end, and gently slice thin sections about two-thirds the way down into the potato, leaving the base solid. You can cut thick slices if you like. Yet I find you get a much better texture and look when you try to make the slices 1/16th to 1/8th inch wide. What Potato Makes the Best Baked Potato? I find that hasselbacks, and baked potatoes in general, are best made with the starchiest varieties of potatoes, like russets and Idaho potatoes. Personally, I like the starchy yellow fleshed Yukon Gold potatoes for all baked potato preparations, as well as for mashed potatoes. Can You Make Hasselback Potatoes with Red Potatoes? Yes, you can. 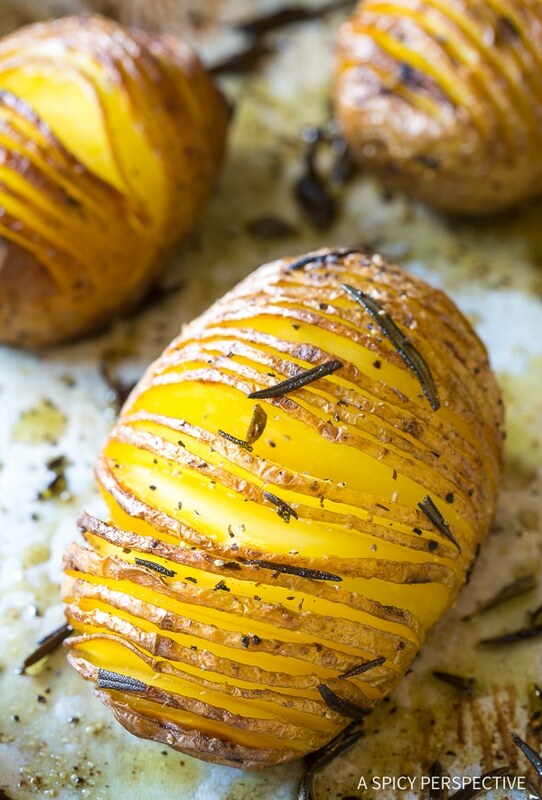 However Crispy Hasselback Potatoes with Rosemary and Garlic do not turn as crunchy on the outside, or open up as much while baking, if made with any sort of new potato. For the fabulous contrast of textures, with crispy edges and delicate folds, use starchy potato varieties. 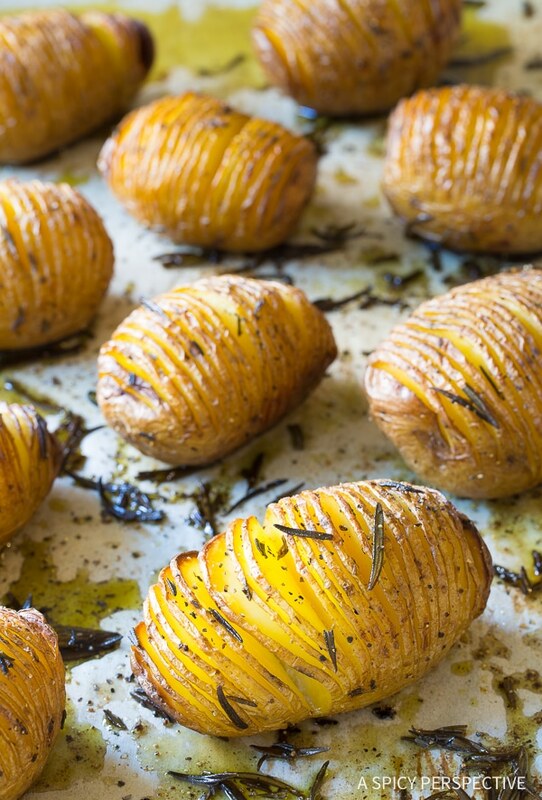 Ready to Make Crispy Hasselback Potatoes with Rosemary and Garlic? Great! Just slice the potatoes thinly, leaving a 1/2 inch base at the bottom to hold them together. Roast them on a baking sheet with olive oil (or bacon grease,) fresh rosemary sprigs, and smashed garlic cloves. Half way through, brush the herb-infused oil over the surface of the potatoes, making sure it seeps down into the layers, and continue roasting in the oven until crispy. You are going to adore these simple delicately layered potatoes kissed with garlic and rosemary! 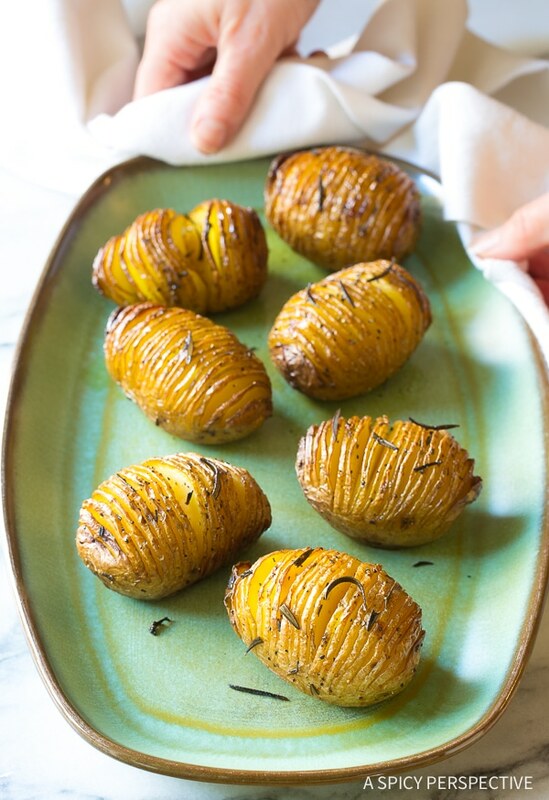 Crispy Hasselback Potatoes with Rosemary and Garlic - A simple hasselback potato recipe with crispy skin, soft interior folds, and tons of herb flavor! 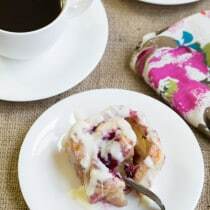 Preheat the oven to 450 degrees F. Line a large rimmed baking sheet with parchment paper. Smash the garlic cloves and peel off the skin. Then pour the bacon grease or oil on the baking sheet and lay the garlic cloves, and rosemary on the sheet pan as well. Hold the end of one potato. 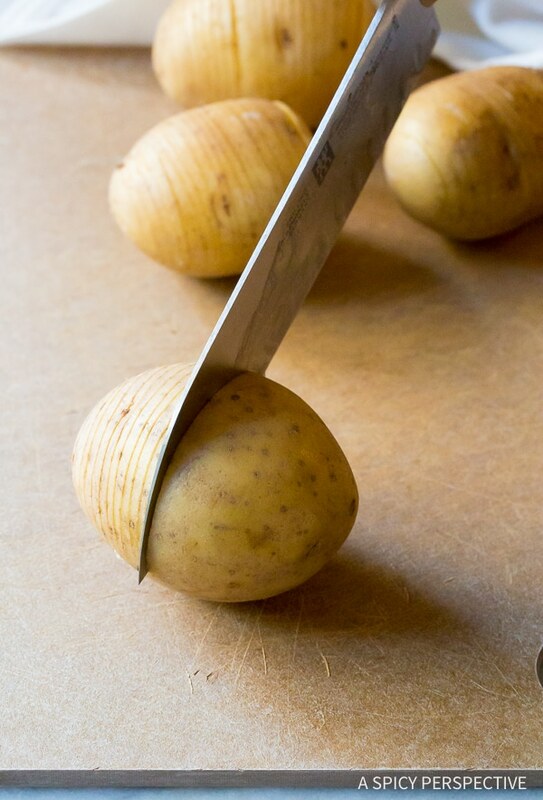 Use a sharp knife to cut across the potato to create 1/16- to 1/8-inch sections. Do not cut through the potato, but cut two-thirds the way down, leaving at least a 1/2 inch solid base at the bottom. Repeat with the remaining potatoes. Place the potatoes on the baking sheet and roll them around to cover them with fat. Set them cut-side-up. Then sprinkle each potato generously with salt and pepper. Roast in the oven for 30 minutes. Then use tongs to gently squeeze the base of each potato to open up the folds. Use a pastry brush to brush the herb-infused pan oils over the top of each potato and in between the folds. Discard the garlic cloves if they are blackened. Roast in the oven for another 30 minutes, until the largest potato is fork tender. Serve warm. These were so good! 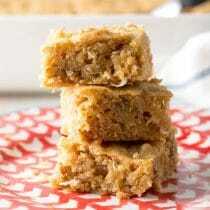 They would be perfect for having guests over – great flavor and presentation. 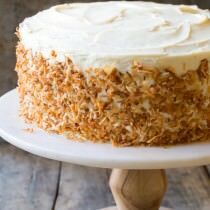 You nailed the crispy factor here! I like them with thyme too.